Second hand track can be a bargain but also a right royal pain. The great thing about model railways, especially OO gauge in the UK, is that there’s so much cheap second-hand stuff available. A visit to any boot-fair or flea market will usually turn up some old track or rolling stock a fraction of the usual prices. But Caveat emptor as they say. While track in particular may appear a good deal, and at first glance look fine, there are plenty problems waiting to catch the unwary later. Electrical problems, derailments and even broken locos can all result. Even your own old track can be problematic. But with a few precautions it’s still worth it and my layouts usually have a considerable mount of reused track on them. In fact, my £35 model railway build project, is built exclusively from the stuff. Here then are my six golden rules for avoiding problems and using second hand track succesfully. Worn and I’ll fitting joiners, fish plates, are probably the single biggest cause of problems on reused track. The joiners hold the rails together and carry electricity from section to section – assuming you aren’t wiring every section. But over time, the joiners wear, bend and distort so they don’t firmly grip the rails, leaving gaps between rails. For this reason the first thing I recommend and always do with second hand track is to replace the joiners . If you do nothing else, follow this one rule. Points are prone to problems over time. The springs come out, tie-bars break and blades wear. While they can be fixed its rarely worth the effort. I now rarely use second hand points, unless I’ve had a chance to test them fully before hand, and usually don’t buy them or throw them away if part of a job lot. This is especially important with flexitrack where the rails are have likely to have been cut. 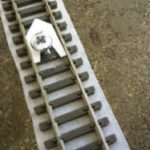 Examine the rail ends and where deformed with cleanly cut them with track tools such as Xuron track cutters or use a Dremel with sanding disc to square them and to expose the correct profile. 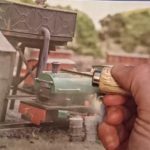 Just like real rails, model railway track can band and buckle over time and this isn’t always obvious on first examination. Before laying rails, look along them to check they haven’t buckled and that they are secured to the sleepers. It’s also worth looking at the rails with a magnifying glass or your head magnifyer to check for damage to the rail heads and that their profile is intact and throw any sections out that are bent. Extra Tip: if you’ve already laid the track, use the camera of a mobile phone to get a track level view along the rails. All track is needs regularly cleaning but second track, which has likely to have been unused for a while and will be dirty, always gets a through clean before use. 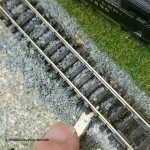 Read my guide on cleaning track for more details and clean the track several times. My last rule applies just as much to new track as second track and all gauges not just OO. Check the space between the rails, eg the gauge. OO gauge rolling stock needs rails that are 16.5mm apart. N gauge requires 9mm of spacing rail to rail while EM gauge mandates 18.2mm, P4 18.5mm and O gauge 31.75 mm between the rails. These are set standards. If the rails work lose of the sleepers the gap can increase, or reduce, and your rolling stock will derail as it encounters rails to wide or narrow for the wheels to fit. Measuring track can be done with calipers (see The 5 Best Track Work Tools). If you then find track that doesn’t match the gauge ditch it. Following these rules ensures I can buy track second hand, saving a fortune, but still be sure my trains will run successfully on it. To successfully use second-hand track do the following before using it. Replace the rail joiners. New joiners are available from Amazon. Clean it, I use this technique. Check the width between the rails with callipers, see link in previous point.